Power showers give a wonderful shower of heated water and are ideal for homes where there is low water pressure from the cold water storage tank and hot water tank. Fitting a shower pump, and the other parts, will overcome low water flow rate and also remove the effect of the shower flow dropping when water is drawn off in another part of the premises. As well as being used to supply the water to showers, double impeller pumps can also be used to feed the water to two or more separate showers, basins, baths and sinks - again this overcomes low water pressure. A high pressure pump (2 bar and above) needs to be used if the supply is required at separate outlets simultaneously. The illustration to the right shows a typical installation of a double impeller pump, however the advice below also applies to built-in and single impeller pumps. Power Showers cannot be fitted to combination boilers or other forms of mains pressure water heating. Check the rating of the pump, they vary between about 1 and 3 bar (which is the pressure but also generally reflect the maximum water flow). Also check if the rating is 'continuous' or 'restricted' - a restricted rating may limit the pump to something like 20 minutes maximum operation then 40 minutes minimum not operating - this may not cause too many problems as some pumps will empty some hot water tank of hot water in less than 8 minutes. The larger the storage tanks the better as the pump will probably use water faster than the mains can replenish the tanks and the hot water heated. As a simple 'rule of thumb', a shower will use 2:1 hot to cold water. So a shower with a flow rate of 18 litres per minute, will be using 12 litres of hot water per minute and 6 litres of cold. 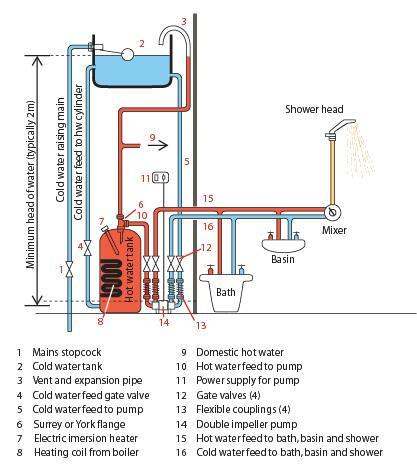 The size of hot water storage required will depend on various factors such as the frequency of showering, time in the shower, flow rate of shower pump and time to re-heat the hot water. A typical small domestic hot water cylinder contains about 95 litres of useful hot water which, in our example of 12 litres per minute, will be used in less than eight minutes. A 180 litre (40 gallon) cold water tank is just about okay for our example but a 225 litre (50 gallon) tank would be required if the hot water cylinder is of a larger size. Remember that the cold water tank supplies both the hot and cold water, so if the total flow of the pump is 18 litres per minute, a 180 litre cold water tank will drain in 10 minutes - as we calculate that the hot water will last for only 8 minutes, there is going to be enough cold water in this instance. The hot and cold water feeds to the pump should come direct from the tanks to ensure that input pressures at the inlets remain as constant as possible. Use at least 22mm pipes to connect between the tanks and the pump, and, as far as practical, from the pump to the taps or shower. This will keep flow resistance to a minimum. As with any pipe and tank in the roof space, the cold water tank and pipework should be insulated where necessary to avoid freezing. Use a 'Surrey', 'York' or 'Essex' flange in the outlet from the hot water cylinder. The first two fit into the standard hot water tank outlets but draw the water from below the very top of the tank to avoid drawing off the aerated water. An 'Essex' flange needs a hole cut in the side of the cylinder, so is probably best avoided by the diy plumber. Air in the water will cause problems with the pump. Use flexible couplings between the rigid pipework and the pump (most pumps are supplied with these, where they are not, suitable flexible couplings will need to be purchased). Using flexible couplings reduces the vibration transmitted from the pump. It is worth fitting gate valves into all four of the pipes near to the pump so that it can easily be isolated if removal is necessary. Don't fit pipe clips too near to the pump (try and leave at least 1 metre clear) and where they are used, avoid using metal pipe clips. Again, this all helps to minimise vibration. Pumps are supplied with vibration absorbing mountings, make sure that they are unobstructed and that nothing touches the body of the pump. Power Showers usually give higher water flows that gravity feed or electric mains showers, so give some thought as to the depth of the shower tray and the waste fitted, these may need to be changed to ensure that the water flows away efficiently. 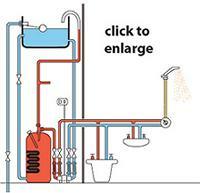 Choose the siting for the pump with care taking into account position of the cold water tank (the pump will have a specified minimum water head - the vertical distance between the water level in the tank and the pump - 2 metres is not uncommon), the location of both the hot and cold feed pipe and the outlet pipes. Often the bottom of the airing cupboard is ideal but is by no means mandatory. Consider the electrical supply for the pump. Under Part P of Building Regulations, a qualified electrician must install any new electrical spur. Normally a double pole, switched and fused spur is required. It can a good idea to fit the pump within a plastic tray especially if there is a built in filter which needs occasional cleaning - the small amount of water released will be caught. Also, pump seals do wear and can leak a little over time. Check all flexible hoses and connections on the pump at least every 6 months and replace any component as necessary to avoid leaks.